A mouse or a rat in your food stores can really ruin your day. These rodents carry disease, can gnaw through almost anything, and can fit through extremely small openings. The cool, dark, dry storage areas that we keep our food in happens to be the holy grail for a mouse or rat. 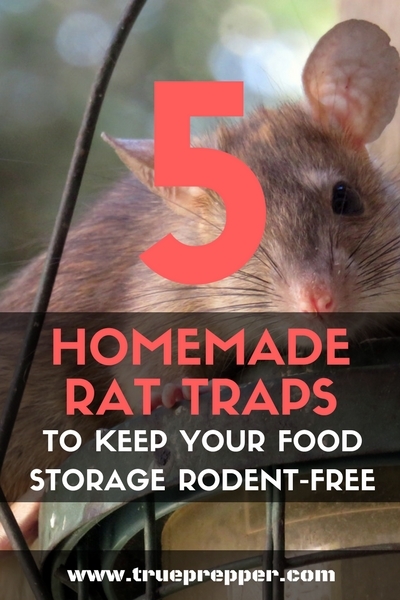 If unnoticed, a rat or mouse could wreak havoc on your food storage in short time. Catching them is pretty easy using mouse and rat traps. The spring loaded ones work great, and they have all sorts of “humane” traps and glue traps available at most hardware stores. But we all know that life doesn’t always work out where you have everything you need. If you find yourself with a rat problem and need to get rid of them fast, try one of the five traps below. This is one of the most common homemade rat traps. You can also use paper towel tubes instead of paper. To pull this one off, you need some paper, a raised surface, a trash can, and some tape. If you happen to have one of these cups around, this makes for a pretty effective trap. It makes for a great trap, because it is a mobile carrier as well. You can catch and release if you really want to with the rat trapped in the cup. Even if you don’t, having the rodent in a container makes it much easier to deal with once it is caught. Similar to a deadfall trap, the bowl trap is pretty common and easy to set up. It is easy for bait to be stolen if the bowl is not big enough, so be sure to pick one that is big enough to trap your target rodent. This one required a little ingenuity to come up with, and it requires a lot more materials. It appears to work pretty effectively in the video. It is not too humane, but it is also not messy. It is a neat concept if you happen to have the tools to pull it off. This clever spinner trap is easy to make using a bottle, a bucket, some wire, and peanut butter. Mice are like little fiends when it comes to peanut butter, and they can’t resist getting themselves into a bad situation. 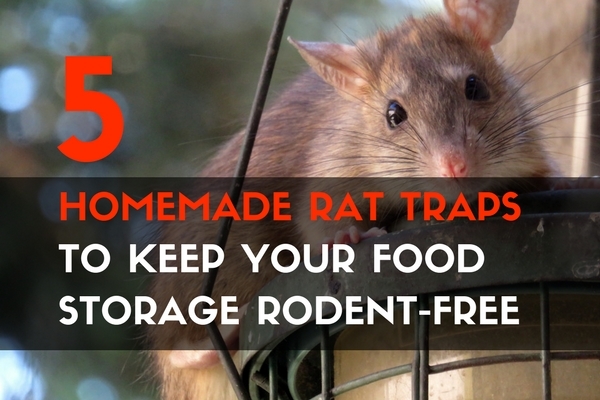 A simple homemade rat trap could keep your supplies safe and disease-free. They are easy to make and there are several methods to pick from. While a store bought trap, such as the spring loaded rat trap works just fine, it doesn’t hurt to know how to get things done with the stuff you already have around your house. Keep exploring, stay prepared, and be safe.